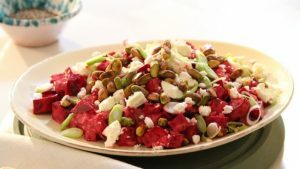 This Beetroot and Feta Cheese Salad has the perfect balance of sweet and salty from the beetroot and feta cheese. Super healthy and tasty… What can beat that?! 1. Cook the beetroot in water for 15-20 minutes until cooked. Removed from heat and rinse in cold running water. Rub hands with oil, to prevent staining skin, and peel off the skin and leave to cool completely. 2. Cube or slice the beet and mix with the onion. Mix the dressing ingredients together and mix with the beet and onion mixture. Place onto a serving platter. 3. Top with feta cheese, roasted nuts and spring onion and serve or chill in the fridge until needed. Recipe adapted from Siba’s Kitchen.